So much for the stock market rally coming to a screeching halt. The S&P 500 surpassed the 2,000 level for the first time ever on Monday morning -- but it failed to finish the day above the 2K mark. It closed a hair under 1,998. Despite a fair amount of ups and downs over the past few months, the popular index of large companies is up 8% this year. And that follows a nearly 30% surge in 2013. If you've had your money in the market since 2009, you're likely very happy -- and a lot richer. The S&P 500 is now up more than 200% since this bull market began in March 2009. 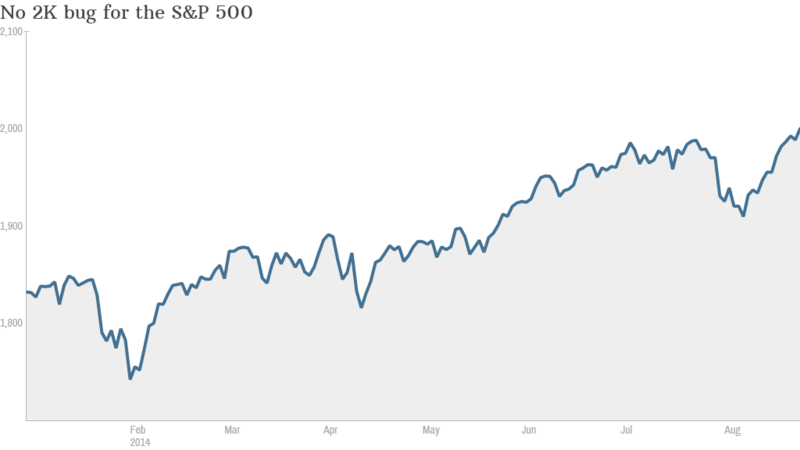 Many people invest in retirement funds that mimic the S&P 500. Why stocks are up: You can thank Europe for this latest surge. 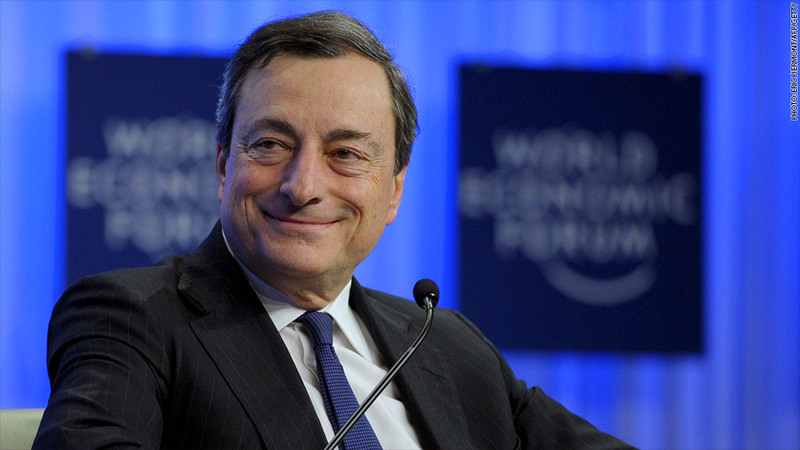 Comments from the head of the European Central Bank on Friday are driving today's action. Mario Draghi, speaking at conference hosted by the Federal Reserve in Wyoming, hinted that the ECB may do more to stimulate the struggling European economy if deflation gets worse. In other words, the Band-aid is ready. The hope is that the ECB may eventually launch a bond buying plan similar to the quantitative easing (QE) program that the Fed has been conducting since the financial crisis in late 2008. But the Fed is currently in the process of unwinding its so-called QE plan. So investors seem excited by the fact that the ECB may be finally ready to step up to the plate and pump more money into the global financial markets. Still, investors may have reason to worry in late October once the Fed is expected to officially end QE, a process that's been dubbed "tapering." Randy Frederick, managing director of trading and derivatives at Charles Schwab, said that the combination of no more QE and uncertainty about the upcoming mid-term elections could lead to more volatility. But he expects smooth sailing for stocks until then. "There is not a lot to worry about right now," he said. Why have stocks have done well all year? One market strategist noted that companies have been reporting decent earnings growth and that stocks are still reasonably valued. Add in some fading concerns (for now at least) about geopolitical tensions in Ukraine and the Middle East and you have a recipe for a market rally. "All in all, the news has been good lately. So it's understandable that stocks are trading higher," said William Lynch, director of investments for Hinsdale Associates, a money management firm. Why you should care: While the S&P 500 may not get as much attention from casual investors as the Dow Jones Industrial Average -- which many people still view as "The Market" -- the S&P 500 is a far more important indicator of how Wall Street is doing. The Dow has only 30 stocks in it and does not include all the big companies that many consumers are more likely to recognize and invest in. For example, Apple (AAPL), Google (GOOGL) and Facebook (FB) are all in the S&P 500 -- but not in the Dow. And many mutual funds that you own in your 401(k), other retirement plans or a 529 for your kid's college savings are likely to be set up to try and beat the performance of the S&P 500. Still, is it really all that important when a market index hits a round number? Yes and no. 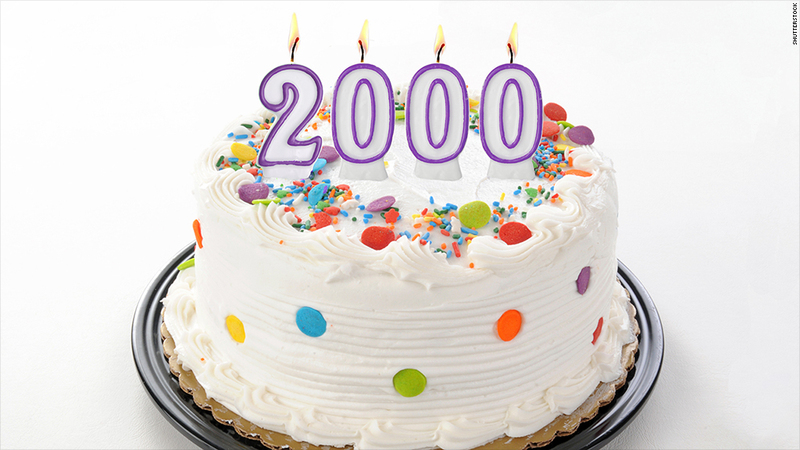 On the one hand, 2,000 is a new all-time high. So that's significant. But in the same way that turning 40-years-old is not really all that different from 39, the S&P 500 passing 2K merely suggests that investors still believe stocks are worth buying even as prices climb higher. It's important to remember the simple rules of math. As stocks continue to go up, it's easier to hit new milestones. Lynch also noted that it's not always wise to make much out of market moves in the sleepy days of late summer. "You have to take this with a grain of salt. So many people are on vacation this week and volume is incredibly light," he said. Who the biggest winners are: A vast majority of the stocks in the S&P 500 are up this year. But what's most impressive is that the biggest gainers come from a wide range of sectors. K-Cup coffee maker Keurig Green Mountain (GMCR) is one of the top dogs in the S&P 500 in 2014. Shares are up nearly 80%. But there are also airlines Southwest (LUV) and Delta (DAL) among the top 15 gainers. So are well-known brand name firms like video game developer Electronic Arts (EA), sporting apparel maker Under Armour (UA) and aluminum giant Alcoa (AA). Energy firms Newfield Exploration Company (NFX), Williams Companies (WMB) and Nabors Industries (NBR). Tech stocks have also done extremely well. In fact, the Nasdaq is up more than 9% this year -- but it is still 11% below its all-time high from March 2000. And CNNMoney's Tech 30 index has surged more than 10% in 2014, led by huge gains in EA, Facebook. Intel (INTC), BlackBerry (BBRY), HP (HPQ) and Netflix (NFLX). In other words, investors have not had to bet on one market trend to do well this year.